Do Medicare Supplement Plans Include Prescription Coverage? Are there pre-existing conditions excluded, or is there a waiting period? How important are the Insurance Companies Financial Ratings? 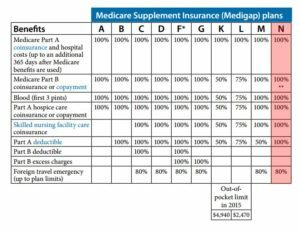 How often can I change my Medicare supplement policy? 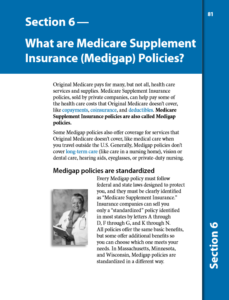 A Medicare supplement plan, (often referred to as “Medigap”) is an insurance policy designed by Medicare that will cover the expenses that Medicare will not fully cover. Although these policies are designed by Medicare, they are sold by private insurance companies, at each of their set prices. All Medicare Supplement plans are “standardized” meaning the benefits are the same, regardless of the carrier that is offering the plan. It is important to understand that the benefits will remain the exact same from company to company. The ONLY difference is the price each company charges. 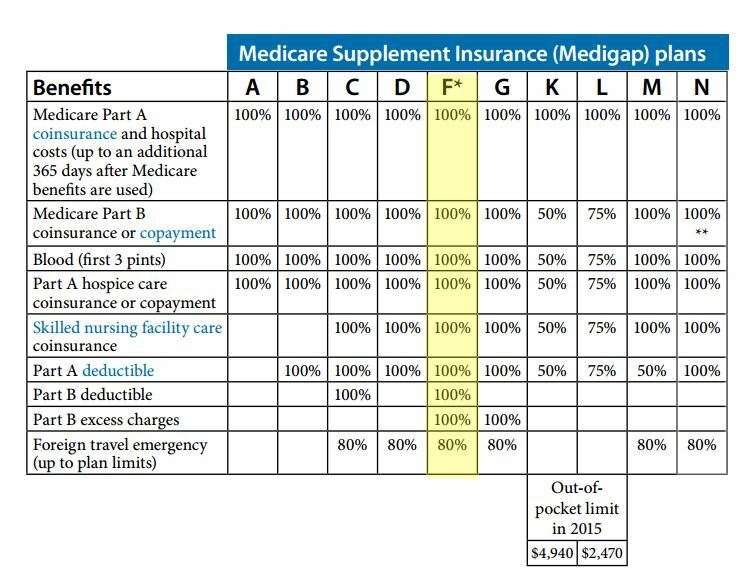 Medicare Supplemental Plans are designed in a letter system, ranging from Plan A to Plan N. Currently, the most popular plans are F, G and N. As with all Medigap Plans, your most important consideration should be cost and coverage. If you are new to Medicare be sure to check out our “Medicare 101” page and download our “Medicare Cheatsheet.” For Medicare Supplement quotes and questions, call us at (800) 208-4974 and one of our Medicare experts will be glad to help you. With ALL Medicare Supplement plans you can go to ANY doctor, hospital or specialist, anywhere in the country that accepts Medicare. It does not matter what insurance carrier you have your plan with, you are free to go anywhere that accepts Medicare. The best time to buy a Medicare Supplement plan is 3-6 months before your 65th birthday or 3-6 months before your Medicare Part B effective date if you are older then 65 and new to Medicare. If you already have a Medicare Supplement plan then you are able to change your plan to a different carrier or to a different plan anytime throughout the year. If you would like to change your supplement plan then call us at (800) 208-4974 and we can help you make the change. 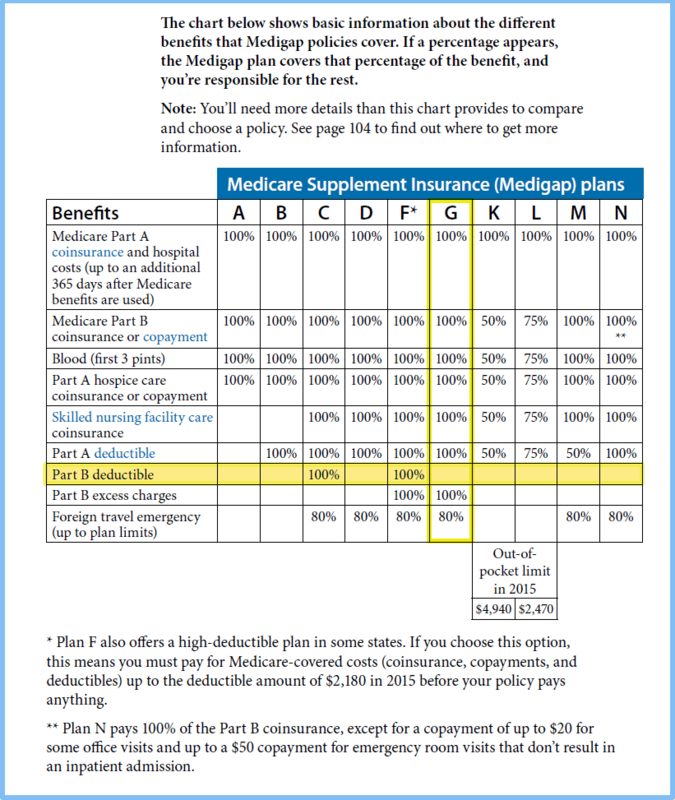 Lately, many folks want to change from a Plan F to a Plan G.
Medigap is just another name for a Medicare Supplement plan, which refers to one of the lettered plans shown in the chart above. 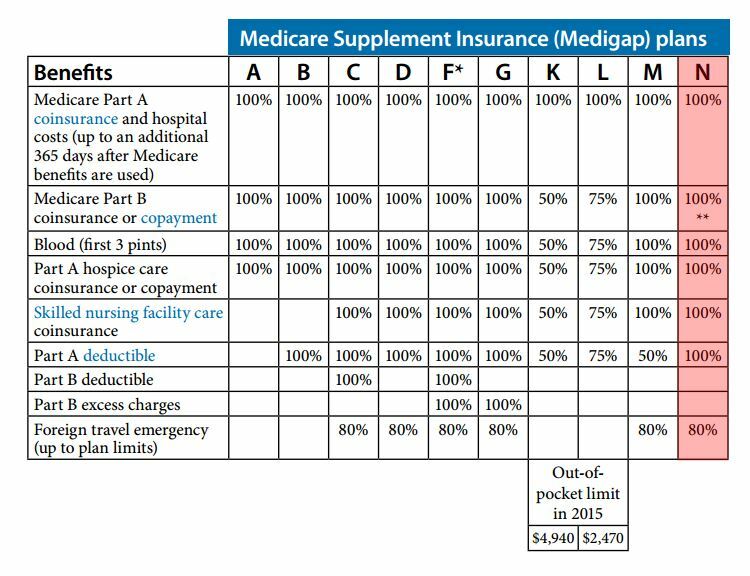 Medicare Supplement Plan F is the most comprehensive supplemental insurance policy, and covers 100% of the major gaps left by Medicare. The reason why many people like Medicare Supplement Plan F is due to the fact that it is hassle-free. There are no claims paperwork to file, and the policy virtually pays everything. In reality, Plan F is the most oversold plan because it generates the most commission for the agent and the insurance company makes a killing off the higher premium vs. other Medigap plans available. Although Medicare Plan F is the most comprehensive policy, that means it is also the most expensive as compared with the other options. We highly recommend plan G over plan F. See our in-depth blog post about Medicare Supplement Plan G here. 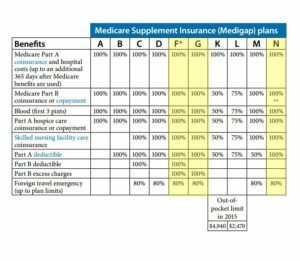 Medicare Supplement Plan G is commonly known as the plan with the best value for your money (at least by us). 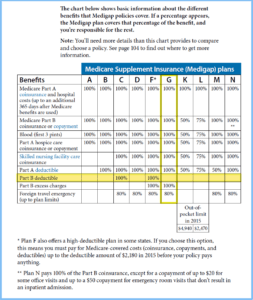 Plan G has almost the same exact benefits as Plan F, although Plan G requires you to pay the annual Medicare Part B Deductible ($185 in 2019). 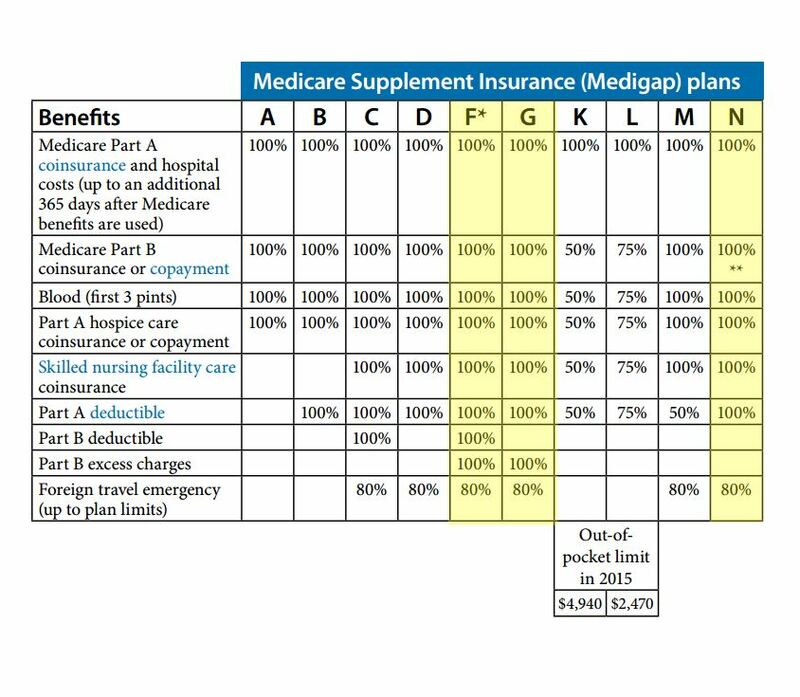 Supplement Plan G covers the 20% Left by Medicare, Medicare Part A Deductible, 100% of Excess Charges, Skilled Nursing Facility Co-Insurance, Foreign Travel, and all of the other major gaps left by Medicare. To learn more about Medicare Plan G visit our comprehensive explanation here. 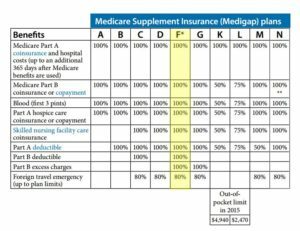 The reason why Medicare Supplement Plan G is more favorable is that, on average, the Supplemental Plan G costs approximately $25 – $50 less per month than the more comprehensive Plan F, thus saving roughly $240 – $500 per year. With the only difference between Plan G and Plan F being the annual Medicare Part B Deductible ($185 in 2019), the premium savings on Plan G usually outweigh the additional cost of paying for the Plan F, and you can still enjoy virtually all of the same benefits. One of the nice things offered with Medicare Supplement Plan G, is that you are able to choose any doctor or hospital that accepts Medicare. Your claims are generally automatically filed as well so there is no need for you to submit claims paperwork and go through all of that hassle. Medicare Plan G is a very easy plan to manage, and there is little to no expenses that you will need to pay out of pocket. If you are an individual looking for the best value out of any Medicare plan, in most situations, we would certainly recommend Medicare Medigap Plan G as being the most cost-effective and cost-efficient–getting the best value for your money. As always, the cost of Medicare Supplement Plan G can vary greatly from company to company, so it is a good idea to compare Medicare Plan G prices with many insurance companies to get the best deal possible. If you are in good health Supplement Plan N might be a good fit for you, however, if you have health concerns, you will likely be better off spending a little more and going with a more comprehensive policy that has little or no co-pays and deductibles like Medicare Supplement Plan G.
The standardized Medicare Supplement Plans (such as F, G & N) do NOT cover prescriptions. By law, they are not permitted to. Prescriptions are covered under a separate insurance plan, referred to as “Part D.” In most areas, there are about 25 different companies offering Part D, drug plans. Each plan covers prescription drugs differently. It is wise to call 1-800-MEDICARE to find out what drug plan is the best fit for your particular drugs. You can generally do this, 1-2 months before you start Medicare for the first time and each year between October 15th and December 7th. Even if you do not take any prescriptions drugs it is a good idea to buy a drug plan. If you do not sign up for a Part D plan when you are first eligible, the government imposes a late fee that is calculated by the number of months you went without a plan and this fee NEVER GOES AWAY! Are pre-existing conditions excluded? Are there any waiting periods to be covered? If you are new to Medicare the Medigap carrier is not allowed to ask any health questions at all. Your health will have no bearing on the premium, nor will it affect you getting approved or not. While in your initial enrollment period with Medicare you can get any Medigap plan of your choice regardless of your health. If you are outside your initial enrollment onto Medicare you can change your plan but you have to undergo “health underwriting.” In this case, with most Medicare supplement plans, the insurance company either will accept you onto a new policy, or they will decline you. If they accept you onto their policy, coverage generally starts on the requested effective day and you are usually covered 100% on that day. To figure out if you will be accepted onto a new policy, please call us at (800) 208-4974. Every state has a guarantee fund that will make sure all claims are paid. Medicare states that you are entitled to a Guaranteed Issue Period. It guarantees you the right to buy a Medigap policy with another company without medical underwriting, (no health questions will be asked). As often as you would like! Contrary to the misconception that you can only change once-per-year, you can actually change your Medicare Supplement Plan at any time throughout the year, and there is no limit on how many times you can change per year. In order to change Medigap plans, you have to answer a series of basic health questions to get approved with the new carrier. Contact us at (800) 208-4974 if you have questions regarding changing plans. We do offer both Medicare Advantage and Medicare Supplement Plans. Because of the many moving parts in Medicare Advantage plans, we recommend you read the full explanation of Medicare Advantage vs Medicare Supplement plans here, before you consider purchasing a Medicare Advantage plan.